TUBERCULOSIS: No test requirements on Georgia cattle. However cattle must originate from herds that are not under TB quarantine. Out-Of-State cattle must meet Georgia’s import requirements. While every reasonable precaution will be taken for safeguarding livestock it should be understood that livestock are entered in competition for prizes and that the owner assumes all responsibility for any accident, loss or damage that may occur. Neither the fair Management, its officers nor agents will be responsible for any such accident , loss or damage. All steers and heifers MUST be in place by the time designated, or otherwise they will receive no consideration from awarding committees. Animal must be registered in exhibitor’s name by August 1st, 2018. Entry Fee is $10.00 per animal to be paid by credit card. No cash or checks please. No fee for Showmanship. Fee is non-refundable. 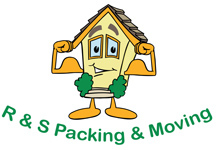 Check-in is from 9 am to 11 am Saturday, October 20th. Steers will remain in barn until the conclusion of the Heifer Show. Steers shall not be left in the barn overnight. Kiwanis will not be responsible for any animal left over night. It is suggested that steers be born after August 1, 2017. Each exhibitor is limited to three (3) steers. All steers will be shown by weight. 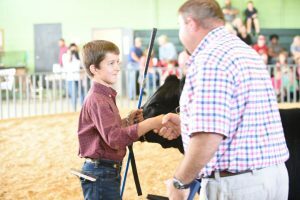 Show officials will determine the number of classes and the number of steers per class. All steers must be halter broke and shown at halter. Steers will be tied with neck rope and halter. All entries must be shown by owner, unless cleared by Show Committee. A handicap or disabled exhibitor may have an assistant as long as the assistant is an exhibitor of this show. There will be no sale of steers. 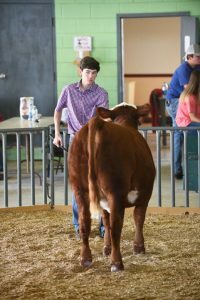 No test requirements on Georgia Cattle. However the cattle must originate from herds not under TB quarantine. Out-of State cattle must meet Georgia import requirements. Heifer must be registered in exhibitors name and in project program by August 1, 2018. Registration papers on purebred heifers must be presented at check-in. 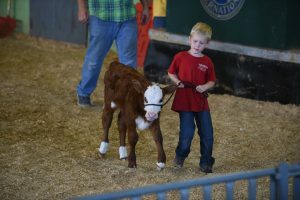 Not more than two (2) heifers can be entered per class by an exhibitor and not more than three (3) heifers in entire show. Heifers that have been calfhood vaccinated for Brucellosis or are from a certified herd need not be tested by must be accompanied by an official health certificate stating that they are vaccinated or from a certified and accredited herd. Heifers that have not been vaccinated or are not from a certified accredited herd must have a negative test for Brucellosis with 30 days of the show and have a health certificate. All entries must be shown by owner, unless cleared through Show Committee. Any handicap or disabled exhibitor may have an assistant as long as the assistant is an exhibitor of this show. Five or more heifers of one breed constitutes a breed. Less than five of a breed will be placed in “Other Breeds” class. All Commercial heifers will be show by weight. Weight classes will be divided by Show Committee.